For the 2018 model year, the focus was on introducing the brand-new C-HR, completely redesigned Camry, a few new TRD & other special edition trim levels and more. That alone sounds like a full plate, but then Toyota also has to continue building all of the vehicles that didn’t receive any updates for the new model year as well. Just because the 2018 Toyota Corolla in Edmonton AB wasn’t updated at all doesn’t make it any less exciting, less of an option or less impressive. It’s still being built as a 2018 model year, it still offers all of the specs & features that we were excited about last year, and it’s still an incredible compact sedan. But we’ll refresh your memory on a few of the specs & features that make it so incredible to give you a better idea of why we’re excited for this carry over. 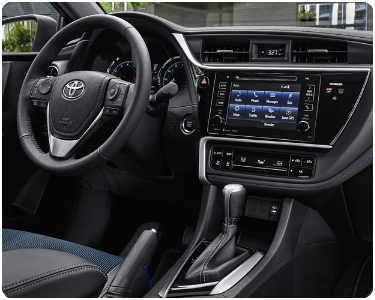 Despite being a compact sedan that isn’t exactly a sports car, the Corolla is still powered by an impressive 1.8L 4-cylinder engine capable of doling out 132 horsepower alongside 128 pound-feet of torque. Those numbers might not sound too incredible, but when you consider the fact that the Corolla only weighs a little over 2,800 pounds they become a bit more impressive. Despite those impressive performance ratings, the Corolla still manages to achieve 6.5 l/100km highway fuel efficiency – or 5.9/6.7 l/100km depending on trim level – and 8.5 l/100km through city streets – 8.3/7.8 l/100km. Additionally, it’s trunk can accommodate 13 cu. ft. of space which might not be as much as a hatchback or anything but is pretty spacious for a compact sedan. We’ve only begun to scratch the surface of what the 2018 Toyota Corolla has to offer. You have to think, we didn’t even touch on any of the comfort, convenience or entertainment features, let alone the hose of safety features found in the vehicle. If you’d like to know more about these other things, be sure to stop in or give us a call. You can also feel free to schedule a test drive right here on this page!